Eating at Disney World comes at a cost (literally). As much as I encourage people to experience all the delicious foods, snacks, drinks that Disney has to offer, for some, it’s just not feasible because of the price. But what if I told you that you can get yourself an extra Dole Whip or maybe spend a little extra on dessert during your next visit just by slightly shifting your spending habits. Yup, it’s true, just by taking advantage of a few tips to save money on food at Disney World, you can further knock out your Disney food bucket list, and better, help you leave the place “where dreams come true” with a slightly fatter wallet. Because let’s be honest, saving $0.50 here or $2 there will definitely add up in the end. So with that being said, let’s jump straight into the vacation money-saving tips! 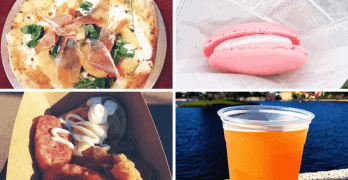 Here are 10 super helpful ways to help you save money on food at Disney World. Some are super easy, some require a little sacrifice, but in the long run, they’ll all save you money. 1. Skip the soda, juice, or milk. Paying upwards of $3.29 for soda, juice, or chocolate milk (and white milk) during every meal will definitely add up. Think about it, if you’re eating 3 meals a day and ordering 3 drinks, that’s going to cost you around $10. Then take that and multiply it by how many people you’re traveling with. It’s a little pricey for soda. That’s why you should consider just ordering a free cup of water with every meal. And if you really need some caffeine, you can always get your free cup of coffee in your resort room. That should hold you over for a little bit. 2. Don’t pay for sides you don’t want. Most of the menu item prices at quick service restaurants usually include the prices of sides like fries, salad, baked beans, etc. But by skipping the sides and getting an entree only, especially if you don’t want them, you can save anywhere from $1-$2.50 on your meal. So just remember, if your meal comes with a side you don’t like, be sure to ask for your meal without the side, and you’ll save upwards of $2. Don’t order what you don’t want to eat! Another tip that always hurts me to recommend is brining your own snacks into the park. Now some of you can’t help it because of certain allergies like gluten or wheat that makes it harder to find acceptable snack options so if that’s the case, packing your own travel snacks is recommend. But for the rest of us, buying snacks every day will definitely add up. Pretzels will cost you $5, chips $3, popcorn $4, and so on. That’s why packing your own snacks and drinks will save you a lot of money during your vacation. However, the only time buying snacks can actually be a cheaper option is if you substitute your meal for a snack like a pretzel or any other filling, salty snack. I’m all about using credit cards especially when it comes to eating out for one reason – cash back. By using restaurant-friendly credit cards like the Chase Sapphire Preferred, you can get 2x the points back on all food purchases (that’s about 2%). Plus other cards like the Discover Card can give you 5% cash back at restaurants during special times of the year. So if this is something that interests you, you should definitely consider getting a restaurant credit card. And of course, there’s always Disney’s Visa Rewards Card which can give you $10 dining credit for every $500 you spend. 5. Go for the affordable buffets during dinner. Most buffets at Disney World are pretty expensive. However, there are a couple that are actually quite affordable – Liberty Tree Tavern at Magic Kingdom and Trail’s End Restaurant at Fort Wilderness Resort and Campground. And the best part about this is that for under $30 ($25 for Trail’s End) you get everything included in your bill. From dessert and drink to all you can eat main courses, it truly is the best bang for your buck, especially if you’re looking for a table service restaurant. But if that’s still too pricey, there’s another restaurant type you can check out which is what you’ll learn below. 6. Eat a quick service restaurants. Quick service restaurants which are the equivalent to fast food or fast casual restaurants are the cheapest dining options available at most Disney Parks and Resorts. That’s why if you’re on a tight budget, you should consider eating at these establishments rather than a table service restaurant. Sure the quality and variety of food is better at table service restaurants, but you still have to pay almost double the price, not including tips. So for cheap eats, be sure to eat a quick service restaurants. 7. Keep your cup and get free refills at special locations. A little known secret that isn’t publicized much about the food options at Disney World is the fact that some of them offer self service drink stations. If you’re unfamiliar with that it basically means that after ordering a drink, you’ll be given a cup that you can then go and fill yourself. So what’s the catch? FREE REFILLS! One thing Disney World doesn’t do is free refills at quick service restaurants. However, some locations at Hollywood Studios and Animal Kingdom do offer self service drink towers which allows you to practically get free refills during your meal. So one little hack is to keep your Disney soda cup because you can go back and refill it during the day. Now I’m 100% confident this is frowned upon, but if money is tight, you gotta do what you gotta do. 8. Skip the character meals. If you ever look at the average price of all the Disney World restaurants, you’ll notice that one type of dining experience hovers at the top – character meals. Character meals, although incredible, are some of the most expensive dining options at Disney World. That’s why I recommend just skipping the meal and finding the characters meet and greet locations throughout the park. 9. Don’t buy the Disney Dining Plan if you don’t eat a lot. There’s so much controversy whether or not the Disney Dining Plan is worth it or not. But in all honesty, it comes down to one thing – how much do you eat. If you’re not a big eater, then save your $60 a day and opt of the Disney Dining Plan. 10. Get the Disney Dining Plan if you eat a lot. If you tend to eat at least 2 meals a day, then the Disney Dining Plan by far is the best option as long as you maximize the DDP correctly. You see, the basic, non-quick service DDP gives you an allotment of 3 credits (1 table service, 1 quick service, and 1 snack) all of which total to around $60 a day. However, if you plan it out correctly, you can practically eat more food that what you’re paying. Want to learn more on how to do this? Check out this in-depth guide on how to maximize Disney Dining Plan credits. Thanks for reading and hopefully you learned how to save money on food at Walt Disney World.